Livia is recognizable through the rendering of the eyes, mouth and chin. The hair is parted in the middle and it is delicately wavy with a series of small curls that frame, and spread out above, the forehead and run down over the ears. In the hair there are remnants of a diadem. The head is turned slightly toward the right shoulder. 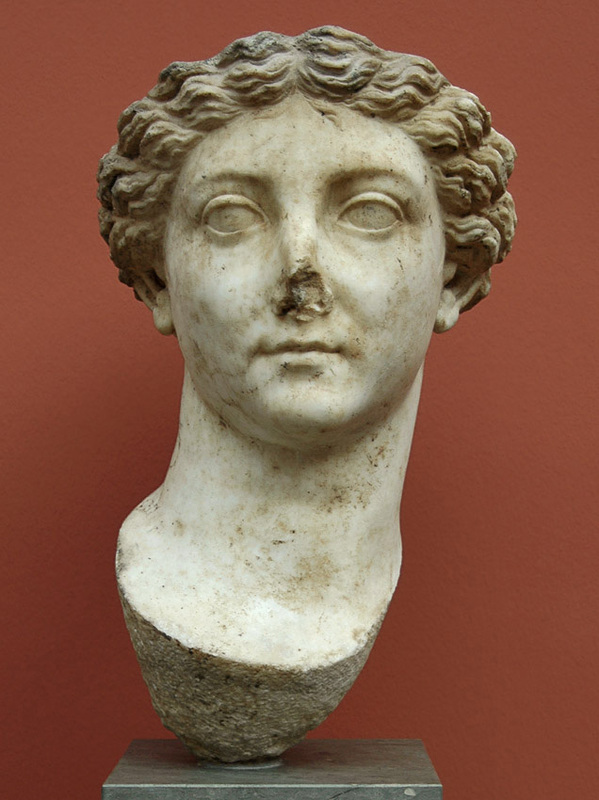 The facial features are more stylized than any of the other Livia portraits at the Glyptotek. The colossal dimensions of the head indicate that this portrait was executed sometime after Livia’s death. Original: Beginning of the 1st cent. AD. Copy: Claudian era. A part of the nose has been cut off and it is missing. A great part of the top of the head is broken off. Acquired in 1895 in Frascati, with a number of other sculptures, through the mediation of Helbig who stated that the portrait was found, together with Claudius (60) and Octavia (42), in Cerveteri, either in the theater or in Gens Julia’s temple. © 1994. Description: F. Johansen. Catalogue Roman Portraits, vol. I. Ny Carlsberg Glyptotek, 1994. P. 100, cat. no. 38.